I think my kor-kor had probably mentioned this before - I eat a lot. Way way way much more than kor-kor last time when he was 5 months old. How much is a lot ah? 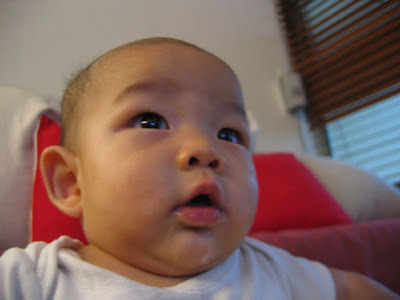 Well, when kok-kor just started on solids, he only ate about 1 or 2 teaspoons of plain rice cereal daily. And then there's still the fruits portion. In order to ensure my bowel movement don't kena jam, I also love eating my fruits. Sometimes I eat about half a jar of the Gerber fruits, while sometimes I can easily wallop 1 whole apple or pear - freshly blended of course. Ooh... I drool so much just thinking about that. Slurp!